Computer Network is a collection of computers and other hardware interconnected with other through communication channels which allow sharing of resources and information. In a computer network each device should be able to send and receive data. There characteristics which classifies a network are communication media, communication protocols, scale and topology. Communication Media is used to to interconnect individual hardware within a network such as electric cable, optical fiber and radio waves. In OSI Model, communication media comes at level 1 & 2. The following wired technologies are sorted in order from slowest to fastest. Twisted Pair Cable: consist of copper wires that are twisted into pairs. Using two wires twisted together helps to reduce crosstalk and electromagnetic induction. Twisted Pair Cable used for both voice and data transmission. Transmission speed range varies from 2 million to 10 billion bits per second. 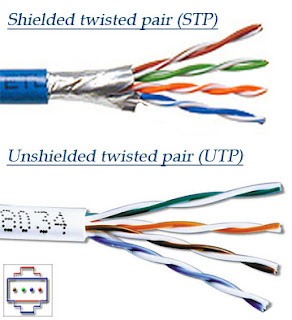 There are two types of twisted pair cable which are "Shielded Twisted Pair (STP)" and "Unshielded Twisted Pair (UTP)"
Coaxial Cable: Mostly used for cable office buildings, work-sites for LAN and television systems. The cables consist of copper or aluminum wire covered by an insulating layer which is also covered by a conductive layer. This multilayer structure help reducing interference and distortion. 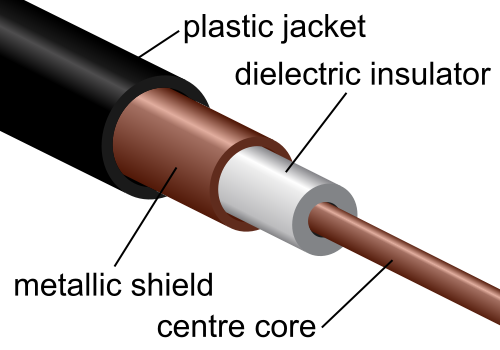 Coaxial Cable transmission speed ranges from 200 to 500 million bits per second. ITU-T G.hn: Used to create a high-speed (up to 1 Gigabit/s) local area network by using existing home wiring (Coaxial, telephone line, power cable etc). 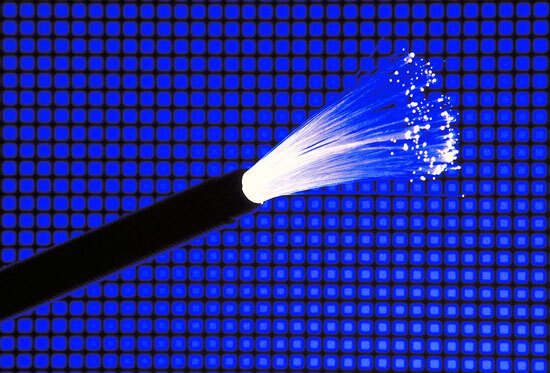 Optical Fiber: is a glass fiber uses light pulses to transfer data. OF provides less transmission loss, immunity from electromagnetic radiation, and up to trillions of bits per second. Different colors of lights can be used to increase the number of messages being sent over a fiber optic cable. Terrestrial Microwave: Uses earth base transmitters and receivers resembling satellite dishes. It has low ghz range which limits communication to line of sight. Communication Satellites: Satellites communicate using microwave radio waves. Earth's atmosphere do not deflected these waves. The satellites are stationed in space and capable of relaying TV, Voice and Data signals. Cellular: systems use several radio communications technologies. The systems divide the region covered into multiple geographic areas. Each area has a low-power transmitter or radio relay antenna device to relay calls from one area to the next area. Radio and Spread Spectrum Technologies: Wireless LANs use spread spectrum technology to enable communication between multiple devices in a limited area. Infrared Communication: Transmission is possible to short distance not more than 10 meters. In most cases source and destination devices are in the line of sight. Many businesses find themselves in a position where their network has grown organically as their company has. The addition of IT components such as server and switches from different vendors are added as and when needed. If not planned correctly the whole management and maintenance can spiral out of control and this can cause a business to incur significant costs and become dependent on 3rd party assistance from a long list of vendors. Microcom IT tries and keeps it simple whether you are a new business just starting out or an established organization, Microcom’s dedicated team of educated and certified professionals can bring to you solutions which best suit your current and future environment. Microcom can evaluate the existing posture of your network and define the long term goals; we develop robust, scalable and inexpensive solutions that provide infrastructure optimization. At the most basic level, it is very important that all the network cabling within the building is done to a high standard. There are various things to consider when cabling is installed and this will affect the overall performance of the network when computer systems, servers and printers are added at a later stage. We provide network cable installation service from small business to large organizations and can do this at very competitive pricing. With our network cabling service you will have the guarantee that your cabling has been done to a professional standard. Nice stuff about wired and wireless technology. After reading this post, my conclusion is that Optical Fiber is the right solution when it comes to Wired Networking. Some thing which really increased my knowledge about Networking. I hope there will more on this topic as many concept still needs to be explain. There are many other things when it comes to networking or computer networks such as network protocols. I hope you will put some light on it. I am waiting for your next post. I'm experiencing some small security issues with my latest site and I would like to find something more secure. Do you have any suggestions? You're so interesting! I don't think I've read something like this before. So nice to find somebody with a few original thoughts on this topic. Really.. thank you for starting this up. This web site is something that is required on the internet, someone with a little originality! It's triggered by the fire communicated in the article I read. And on this post "Computer Network-Communication Media". I was excited enough to write a thought :-) I do have a couple of questions for you if you usually do not mind. Is it just me or do some of the responses look as if they are written by brain dead individuals? :-P And, if you are writing at additional sites, I'd like to keep up with you. more about your post on AOL? I need a specialist in this house to resolve my problem. that I've a very just right uncanny feeling I came upon exactly what I needed. I so much unquestionably will make certain to don?t put out of your mind this website and provides it a glance regularly. What's up mates, its enormous piece of writing concerning cultureand entirely explained, keep it up all the time. Thank you a lot and I'm having a look ahead to touch you. Will you please drop me a e-mail?